With the 50th selection of the 2018 NFL Draft, the Dallas Cowboys have selected Connor Williams. The former Texas tackle was selected 50th overall after finishing the 2017 season with an 85.7 overall grade. Williams ranked 38th in pass-blocking efficiency among draft-eligible tackles in 2017 (97.1). 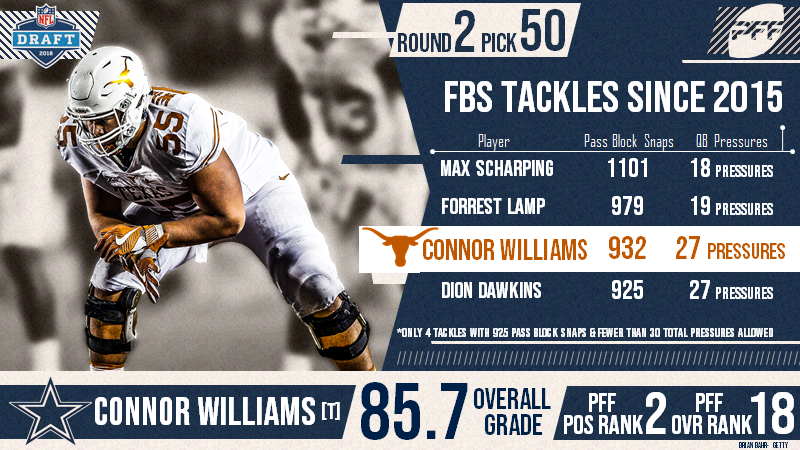 Williams ranked 10th among draft-eligible tackles in run-blocking success percentage in 2017 (94.0).